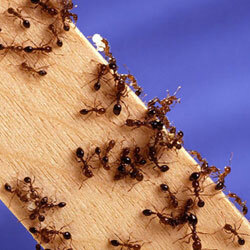 Ant control is an often requested service in the pest control business. According to the NPMA Field Guide to Structural Pests, ants are one of the most successful group of insects. These social insects live in colonies with nests usually located on the ground. Ants usually make their way indoors looking for shelter, water and/or food. While ants will feed on most foods (meats, eggs, oils and fats), most ants are attracted to sweets and come inside looking for such. The Argentine ant is well-established in the Southern California landscape. Ant control is often requested for this ant species, seen trailing in and around many different types of structures. Why Do Ants Come Inside? Ants need water to survive and moisture is a contributing factor to what makes an appropriate nesting site. Argentine ants can enter residences when outside conditions are either too dry or too wet. It is at these times that ants are found nesting indoors near water sources. Ants inside are usually found near plumbing access lines under bathroom and kitchen sinks. Have you ever turned on the bathtub spout only to see tiny black ants come pouring out? Argentine ants are not aggressive toward other Argentine ants and will often join together to create huge supercolonies. This behavior helps Argentine ant colonies survive. Argentine ants begin to build up colonies in the spring. These colonies die off in the fall and resume their numbers again the following spring. Argentine ants can be identified by their continuous trails, which Argentine worker ants follow when they are scouting for food and water. Argentine ants can be a difficult ant species to control for a variety of reasons. Mostly because Argentine ants are highly adapted to living with humans. These ants set up satellite colonies connected by trails. The advantage of establishing multiple subcolonies is that the colony as a whole is not eliminated if one satellite colony is destroyed. 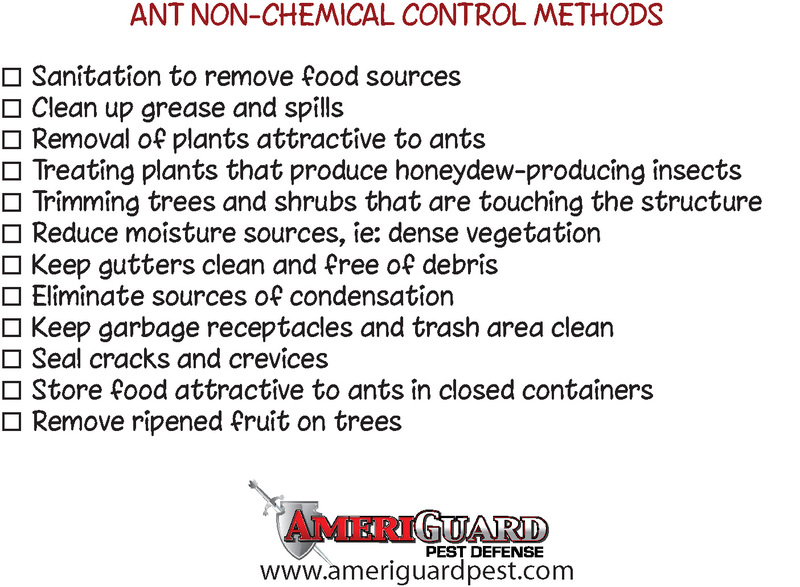 Ant control can be achieved with the help of our customers. It is essential that certain conditions contributing to the ant infestation be corrected and treated to achieve optimum results. Just when you think you have eliminated your ant problem, the ants come back. It could be that you were successful in your battle against a satellite colony invading your sugar, but another subcolony is nesting in a nearby wall void and is now coming out of the electrical outlet and plumbing fixtures in your kids’ bathroom. AmeriGuard Pest Defense uses top quality products specifically for ant control. The ants will not even realize that they are trailing over the product and unintentionally carrying it back to the nest where they share food and groom each other. Termidor, a highly effective ant control product, creates a plague-like effect within the ant colony and spreads throughout the ant nest. If you are tired of fighting what seems like a never ending battle, call your pest professionals at AmeriGuard Pest Defense at (951) 652-0505. A One-Time Ant Control Service will come with a 30-Day Guarantee. If you decide you need monthly or bi-monthly services to cover all of your general pest needs, you will have a year-round guarantee as long as regular services are kept up. No contracts required!